Poor soil conditions can cause concrete slabs to settle overtime. Settled concrete not only looks unsightly but can also cause accidents. Concrete slab settlement is mostly seen around driveways, pavements and backyards. 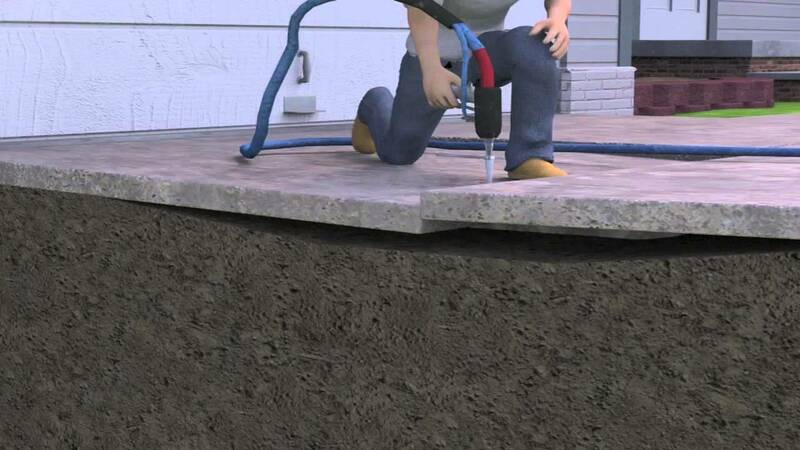 Traditionally, a grout mix was poured underneath the concrete slabs creating multiple holes. As the mixture fills up the space underneath, the slab gets back to its original height. Mud-jacking is still in use, but if you are looking for a better alternative, polyurethane foam concrete lifting should fit the bill. In this post, we are discussing further on polyurethane foam concrete raising. What is polyurethane foam concrete raising? Why consider this over mud-jacking? There are two basic advantages of polyurethane foam concrete raising. First and foremost, the material is extremely light, so it doesn’t cause extra pressure on the soil underneath, and that keeps the ground stable. In fact, it is the most preferred solution for concrete raising for areas where the soil is problematic. Secondly, polyurethane foam concrete raising doesn’t have any downtime. Compared to slab jacking, the process needs much less time, and you can use the area soon after. Some polyurethane foam is waterproof, so eventually, water seeping will not damage the foam material underneath. If you want to consider this form of concrete raising, it is absolutely important to find a company that you can rely on. Not all companies have waterproof polyurethane foam, so ask in advance. It is also important to note that the cost of concrete raising is not covered under insurance, and as a smart consumer, you should ask about the estimate beforehand. Also, keep in mind that polyurethane foam concrete raising is more expensive than standard mud-jacking, so if the repairs are extensive, you may want to think of the latter too. Check online now for contractors for polyurethane foam concrete raising and get your slabs checked for repair needs. Guide 101: Things Homeowners Must Know About FSC Lumber!